4. 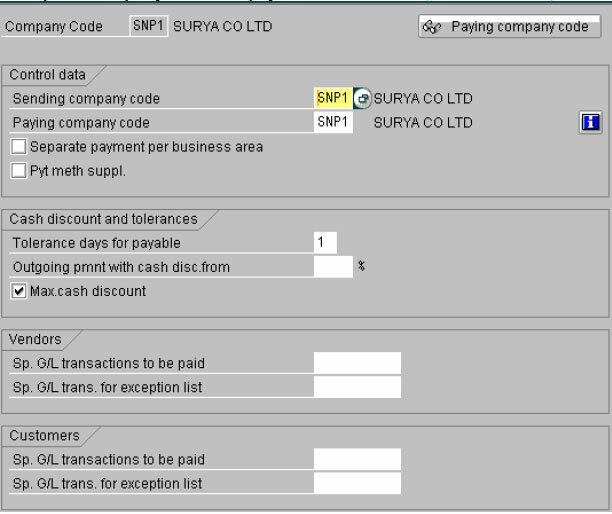 Set Up Payment Methods per Company Code for Payment Transactions (T Code. This activity is found in Customizing under Financial Accounting -> Accounts Receivable and Accounts Payable -> Business Transactions -> Outgoing Payments -> Automatic Outgoing Payments . You assign a paying company code to each company code. This means that you can have one company code process payment transactions centrally for several company codes. Select the field if you wish to use payment method supplements, and then define the payment method supplements in the activity Define Payment Method Supplements. The payment program uses these entries to determine the cash discount strategy for the company code. Specify which special G/L transactions are to be settled for customers and vendors. Here you specify the minimum amount for which an incoming or outgoing payment is created, for example. You can define additional amount limits for the payment method. To do so, choose the activity Set Up Payment Methods per Company Code for Payment Transactions. You can show or hide the settings for paying with bills of exchange. If you wish to print payment advice notes or an EDI accompanying sheet, specify the form name. Specify also the SAPscript text modules that contain details about the sender that are to be printed on the payment advice note. You can go directly from this transaction to the transaction for editing forms and text modules. Here you specify the type of payment method in question (such as check or bank transfer) and any other features of that payment method (the payment method is used for personnel payments, for example). When you select a payment method, only the characteristics that are appropriate for that payment method are displayed. This means that you can only select fields that are relevant for the selected payment method. Required entries in master record Here you determine which specifications in the master record control whether the payment method is used (such as bank details or collection authorization). Note: If the required details have not been entered in the master record, the payment method cannot be used. You specify how the payment is to be posted, for example (such as which document type is to be used). One option is to use the classic payment medium programs. All the payment medium programs contain extensive country-specific documentation. If required, you can call up a list of all the payment medium programs available in the standard system, as described under Activities. In this activity, you specify which payment methods can be used per company code and determine the conditions under which a payment method should be used. Note: You always have to specify a maximum amount, otherwise the payment method cannot be used. If you specify the payment method in an open item, the payment program ignores the amounts you enter here. For the paying company codes, specify the bank accounts to be used for making payments. To do so, choose Set Up Bank Determination for Payment Transactions. Enter the banks and the bank ranking order. Select the paying company code, and double-click Ranking. Define the bank accounts. Select the paying company code and double-click Bank accounts. Define the available amounts. Select the paying company code and double-click Available amounts. Define the value date. Select the paying company code and double-click Value date. Define the charges for bill of exchange payments. Select the paying company code and double-click Expenses/Charges. • With which form payment is made. • The forms are to be defined in the system using SAPscript. For every paying company code, you specify which form is used per payment method. You have created your house banks in the Define House Banks activity.